Small isolated medieval churches, scattered smaller farms in landscape of medium-sized rectangular fields, with small post-medieval nucleated settlements. The area covers parts of five medieval ecclesiastical parishes - part of the large parish of Llanynys and parts of the smaller parishes of Llandyrnog, Llangwyfan, Llangynhafal, and Llanychan, the parish of Llanychan, at 567 acres, being the smallest parish within the diocese of St Asaph. The area falls partly within the western commote of Colion but mostly within the northern commote of Dogfeilyn, in the ancient cantref of Dyffryn Clwyd. Early settlement possibly indicated by a Neolithic polished flint axe found near Llangwyfan church and a Bronze Age arrowhead near Gellifor. 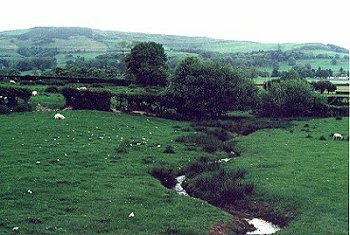 Undulating lowland, above the floodplain, consistently sloping from east to west but broken by steep-sided tree-lined streams running from the western edge of the Clwydian hills. The land rises from low-lying wetter land on the western side of the area, at a height of about 35m, to the base of the hills on the east, at a height of about 130m. A variety of different settlement forms are present within the area. Several of the medieval churches are fairly isolated, although a village has grown up around one of the churches, and other nucleated hamlets have developed around a chapel or school in the later 18th and 19th centuries. Otherwise settlement is represented by scattered farms, cottages and larger houses, some of which have medieval origins. Llandyrnog possesses one of the four medieval churches in the area, but is the only one which falls within a nucleated settlement of any size today. The church, dedicated to the 6th-century St Ternog, was itself in existence by at least the mid 13th century, though the surviving stone fabric is late 15th-century, rendered and Victorianized. The history of settlement around the church is unclear, the present settlement being largely modern, including 18th and 19th-century shale, limestone and brick houses and cottages, inn, school, shop, rectory, and with three 19th-century nonconformist chapels on the periphery, with modern housing estates, smallholdings and large milk factory on outskirts. By contrast, little if any nucleated settlement survives in the vicinity of the medieval churches at Llanychan, Llangynhafal, and Llangwyfan, all of which had been established by the 13th century, if not earlier. Like Llandyrnog, Llanychan lies on the lower ground but a slight rise above the valley bottom, whilst Llangynhafal and Llangwyfan are hidden away at the foot of the western slopes of the Clwydian hills. St Hychan's, Llanychan is accompanied by no more a brick school and schoolhouse of 1866, now used as a house, St Cwyfan's Llangwyfan by no more than a farm (apart from the ancillary buildings of the 20th-century sanatorium (1918-81), by which it is now dominated, which replaced Plas Llangwyfan, a small late 16th-century house), and St Cynhafal's, Llangynhafal by no more than a farm and a house, Plas-yn-llan, a late half-timbered 16th-century two-storey house. The early use of stone for building is evident in the case of the churches where medieval fabric survives, and in the case of the slatey drystone churchyard walls at Llangwyfan. Other nucleated settlements in the character are of post-medieval origin, representing an expansion of settlement away from the earlier parochial centres. The present settlement of Llangynhafal, 400m to the west of the medieval church, lies on one of the minor routes along the vale, and includes an inn, former 19th-century school, and a small number of houses. Hendrerwydd is a hamlet composed of two or three small farms and several 18th/19th-century brick and rendered cottages, 18th-century inn, and 20th-century houses. Ffordd-las is a chapel settlement of 18th and 19th-century rendered and brick cottages and some modern houses, the chapel being dated to 1834, which like the cluster of 18th-20th century cottages at Commins sprung up along the roadside. Gellifor is mentioned in 1282; a map of 1779 shows a small triangular area of open common with buildings around it, though by the 19th century the common had been enclosed, by which time the settlement consisted of Gellifor Farm, a 19th-century brick and rendered farmhouse and brick outbuildings, the chapel first built in 1815, and a handful of houses. Today the settlement comprises 19th- and 20th-century houses, 20th-century housing estate, a late 19th-century brick school, and a limestone chapel rebuilt in 1860. A number of other small nucleated settlements developed at cross-roads as in case of the 18th-century or earlier stone cottages at Groes-fawr, or around a mill, as in the case of the cluster of 18th/19th-century cottages, farm and houses at Pentre'r-felin. Other scattered cottages sprung up along the main roadways during the 18th and 20th centuries, as along the road between Gellifor and Hendrerwydd, and along road between Llandyrnog and Llangynhafal. Relatively small, scattered farms and cottages generally about 500-600m apart, often on the roadside or within nucleated settlements. A number of the farms date to at least the late 15th to early 16th century. Hendre'r ywydd-uchaf, was a late 15th-century five-bay cruck house, retaining timber-framed outer walls, now reconstructed at St Fagan's museum, Hendre'r ywydd being a single bay cruck framed hall, dated by dendrochronology to 1508. Other early buildings include Plas Coch, a half-timbered farmhouse, with early 19th-century brick exterior and brick outbuildings, and Plas Iago, a cruck-framed timber hall, now with external stone walls. Ty-coch, north of Llangynhafal, has a 17th-century barn with four cruck trusses, timber-framed walls with brick infilling. Seler, north-west of Llangynhafal, has late medieval to early post-medieval timber-framed with brick infill and stone outbuildings, and a 19th-century rendered farmhouse. Numerous other farms were rebuilt or built anew in the 18th and 19th centuries, often rendered or in brick, including, for example, farmhouses and outbuildings at Llawog, Plâs-Siors, Plâs Bennett, Pentre'r-felin-ucha farm, Bryn-ogwallt, Pentre-mawr and Pentre-bach. Only a small number of larger houses fall within the area, including the late 19th-century rendered house at Cerrigllwydion Hall, and the Victorian rendered villa with entrance gates at Plas Isaf, east of Hendrewydd. Medium-sized rectangular fields aligned across and down the slope with some low field banks and lynchets on steeper slopes, generally bounded by low, mature hedges of hawthorn, hazel and holly. Some distinct areas of strip-fields, along the slope to the east of Llandyrnog village, and up and down the slope in the area of Ffordd-las, some of which have been amalgamated into larger fields in recent years. Scattered larger oaks and ash and tall alder, poplar and willows along brooks. Fast-running streams and well-drained ground on the higher, eastern side of the area with slower, embanked streams and dykes and more poorly drained ground on the lower-lying ground on the west. Occasional stone gateposts and numerous former milk churn stands in either wood, brick, concrete or stone. Little woodland survives in the areas today, though there were still woodland in existence at Gellifor and along the south-west edge of the area, between Rhydonen and Llanychan in the medieval period, the 'pleas of the forest' being recorded as having been held in the grove at Gethlivor (Berry 1994). A number of woodland names occur, including that of Gellifor itself. The distinctive pattern of medium-sized rectangular fields appears essentially to represent the orderly late medieval and early post-medieval enclosure of former common pasture, meadow and woodland, together with the consolidation and enclosure of probably small areas of open arable within each of the parishes and townships, the boundaries of which it is now difficult to define with precision. Former commons are referred to in a number of place-names, including that of Commins itself, to the north of Gellifor. Roads and tracks tend to be either north-south along the contour or up and down the slope, linking communities at the base of the hills with the valley bottom, many of the roads running between farms and nucleated settlements and often cutting across the field layout. Many of the roads, particularly on the more sloping ground, run in distinct hollow-ways created before the advent of road drainage and modern road surfaces, the hollow-ways sometimes revetted with drystone walls of local stone, including glacial boulders in roadside walls near Llangynhafal church. Industry is represented by former watermills at Felin-isaf to the west of Llandyrnog and Pentre'r-felin-ucha to the east. Wordsworth stayed twice with his friend Robert Jones at Plas-yn-llan, Llangynhafal in the 1790s: 'He says [wrote his sister Dorothy] that their home is quite a cottage, just such a one as would suit us and oh! how sweetly situated in the most delicious of all Vales, the Vale of Clwyd'. The only parkland included in the character area is the relatively small area around Cerrigllwydion Hall, divided by post and wire fences and with mature beech, oak, ash and pine, with 19th-century roadside lodge and gates and roadside walling, and the small area of parkland with coniferous and deciduous trees.